As if waiting to seize that perfect moment to attack from the shadows of a depleted brick wall or a broken down vehicle, these accurately reproduced 1:35 scale U.S. infantry figures capture the intensity of the front line. 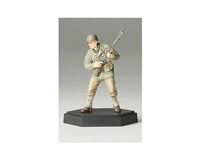 Consisting of 5 figures to collect, including 2 non-commissioned officers, 2 riflemen and 1 machine gunner, this series of figures will bring the action of WWII to the palm of your hands. 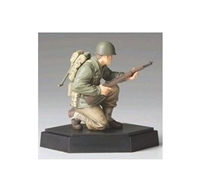 Uniform, canteen, ammunition pouches, helmet, Thompson submachine gun, M1 Carbine and M1 Garand semi-automatic rifle, and Browning automatic rifle have all been reproduced in fantastic detail and accuracy.